Design is more than just making a product pretty—it’s what makes customers loyal. The most creative companies in the world understand that design is about creating experiences that consumers crave. The look and feel of a product is table stakes—it can forge the beginning of an emotional bond with customers. The best products and services must deliver singular experiences unobtainable anywhere else. The smartest designs address needs consumers never knew they had. If there was ever a company to make the case that the best design is about creating great experiences, it’s Apple. Forests have been felled to publish the hundreds of books, magazine articles, and newspaper clippings to chronicle the Cupertino company’s success. Apple made cute computers for an elite bunch for years, until it exploded onto the mainstream consumer consciousness with the iPod. The portable digital music player didn’t do anything that several other rival devices weren’t already doing. It just did it better. A lot better. Apple created a gorgeous device that seamlessly connected to a music store offering easy access to more tunes than any consumer could ever hope to hear. Every company, every design consultant, every journalist, holds Apple up as the model. Rather than racing to the bottom, cutting costs to eke out modest earnings while edging out competitors, Apple went in the other direction. It spent more money designing a series of gadgets consumers loved. And because they were smitten, those consumers were willing to pay a premium over the other somewhat similar gadgets on the store shelves nearby. Apple’s earnings soared. It became one of the most admired brands on the face of the earth. As brilliant as Apple is, though, it’s not the only company that’s been able to ride great design to economic heights. And the others have taken entirely different paths from Apple’s. There's a common thread: doing consistently great design requires a commitment to it. 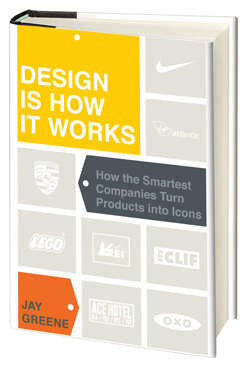 Design Is How It Works zeroes in on the design process at eight companies that do design well. The companies come in different sizes. They operate in different businesses, and on different continents. Some are decades old and others are just a few years young. There are publicly traded corporations and privately held businesses. The point is that design is something at which any company can succeed. And Design Is How It Works shows how companies that embrace the idea that design is about creating a great experience are the ones that will flourish in the 21st Century.